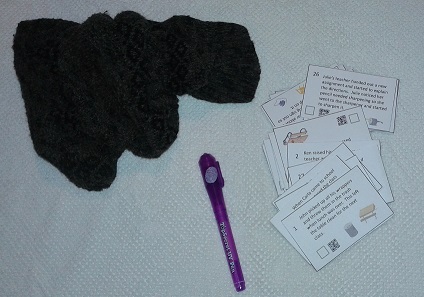 I needed a good set of task cards to review actions that students may do or observe others do. You may find them useful if you are teaching from this curriculum. They are double sided with an unexpected behavior on one side and a matching expected behavior on the other side. I put the cards in a draw bag. The students reached in and drew a card out, and placed it on the table. They then decided if the side facing up was an expected behavior or unexpected. They talked about how the actions make them feel. If the unexpected is presented first, students can talk about what they think the expected behavior would be on the other side. Students checked their answers by using the Top Secret UV light which I got at our book fair. I put a U or and E in the box for them to check. There is also a QR code for those who would prefer to use a scanner. My students find this motivating and they can self check if they are working in small table groups. The draw bag is an easy thing to make. I took a sleeve off an old sweater and sewed across the bottom. The cuff makes a nice finished opening and the bag is stretchy. It has got to be the easiest bag I have ever made. In my TPT packet, there are 28 expected cards and 28 matching unexpected cards side by side. They are meant to be printed on card stock, cut on the horizontal lines and folded back to make a double sided card. I put a box on each card so I could write with my UV light pen a U or E in the box. Students can light the answer up. I also put a QR code for those who like that option. The QR code is from http://www.qrstuff.com/. When scanned it will read expected or unexpected to correspond to the side it is on. I am putting 2 pages of the cards below for you to review as a freebie. If you like them consider getting the full set at TPT. Just click on the cover page button at the top for a direct link to the product. Your patronage covers the cost of this website and keeps it advertisement free, except for me I suppose. I am trying to keep the commercial aspect down and provide resources. I know most of us are on really tight budgets. Great activity! I really appreciate simple adjustments to a game or activity that make the difference between dulls-ville and WOW! Adding the QR code and UV option does just that. I have a UV flashlight decoder that was included in SuperDuper product and I can’t wait to use it with yours. It is amazing what a pen light will do. I bought a 2nd one this year. Thanks for commenting.